One System, Two Media: How China, Hong Kong Are Covering The Protests : The Two-Way Hong Kong media are providing wall-to-wall coverage of the protests calling for the resignation of Chief Executive Leung Chun-ying, but in mainland China there has been little mention of the unrest. 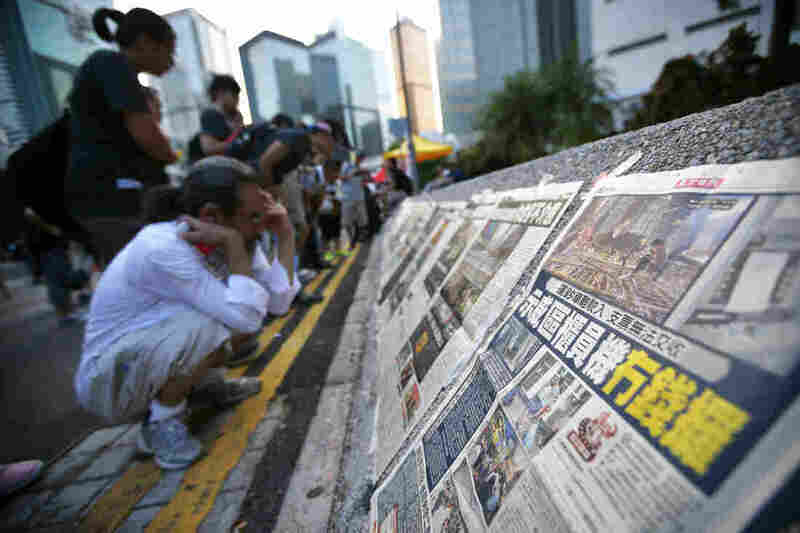 People read newspapers placed along a street blocked by protesters outside the government headquarters building in Hong Kong on Wednesday. While Hong Kong media are covering the protests closely, media in mainland China have been mostly quiet. Hong Kong media are providing wall-to-wall coverage of the protests calling for the resignation of Chief Executive Leung Chun-ying, but in mainland China there has been little to no mention of the unrest. The contrast is an illustration of the "one country, two systems" policy that has been in place since the former British colony reverted to Chinese rule in 1997. "It is understandable that different people may have different ideas about a desirable reform package. But it is definitely better to have universal suffrage than not. It is definitely better to have the CE elected by five million eligible voters than by 1,200 people." Here's a screenshot from today of the news agency's English-language website. Most of the mainland's major newspapers printed Xinhua news reports that touched on the negative impacts that the protests were said to be having on life in Hong Kong. China Daily, the largest English-language newspaper in China, carried a report from Xinhua quoting Leung as urging the demonstrators to end the protest immediately. Another story in the newspaper, this one by its own journalists, reported on a counterdemonstration by "the majority" on Sunday. A third story in the paper, also by its reporters, detailed the ways in which the protests have "disrupted" daily life. The People's Daily, in its foreign edition, called the Occupy Central movement "illegal," and reported that the Hong Kong community is calling for a return to "normal order." The paper's domestic edition, in a commentary, called the protesters "selfish." "They incite people, paralyze traffic, impede businesses, cause conflict and seriously disturb the normal life of the people of Hong Kong, and even pose a threat to life and property," the newspaper reads. The Associated Press, meanwhile, reports that no images of the Hong Kong protests have appeared in China's state-run media. "The authorities see this as a matter of life and death," Shanghai-based columnist and independent analyst Zhao Chu told the news service. "They don't see it as a local affair but a fuse that can take down their world." "Censorship of microblogs — including phrases such as 'tear gas' — has kept online discussion muted," the AP adds. "The image-sharing Instagram service was shut down in China over the weekend. ... Some images from Hong Kong's streets have seeped into the mainland via cellphone messaging services. Many users have converted words into images to avoid having searchable text that can be easily caught by censors. Still, users are complaining of posts being deleted, including in private chats with friends." In Hong Kong, it's a different story. 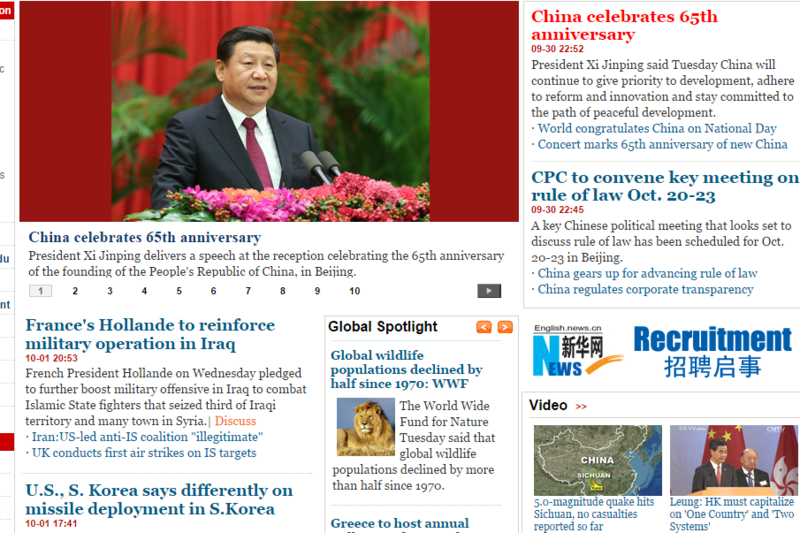 Here's a screenshot from the South China Morning Post website today. 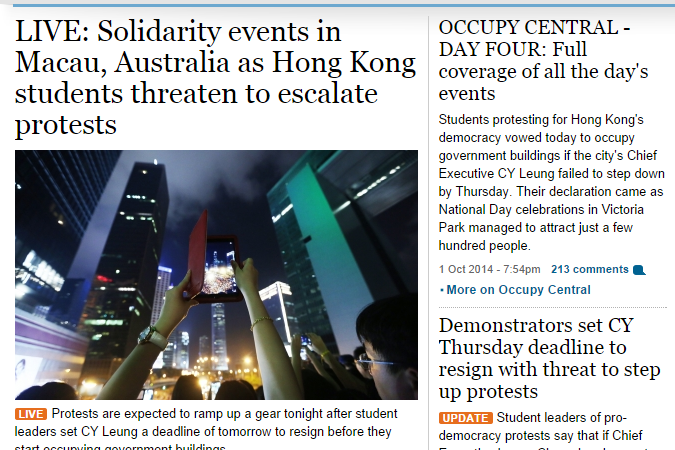 But some media in Hong Kong oppose the protests. Wen Wei Po, a pro-Beijing newspaper, said the protesters have caused the situation to become "out of control." And the AP adds: "In Hong Kong, broadcasters NOW and Cable TV have carried wall-to-wall coverage of the unfolding events, including student leaders storming government headquarters Friday and the running clashes with police over the weekend. Hong Kong's pro-democracy newspaper, the popular Apple Daily, has run its own live Internet feed that features aerial images of the crowds captured by a drone."